Citation: Herath JC, Wali MA. Sudden death of an infant due to complex congenital cardiac abnormality including an interrupted aortic arch, abnormal pulmonary artery and a peri-membranous ventricular septal defect. J Clin Path Lab Med. 2017;1(2):6-8. Background: Sudden death in infants has a wide differential, but most often has no clear etiology. Most of the time after a complete autopsy cause of death remains unascertained in most infant deaths. Case presentation: This is a case about an 8 day old infant who was found deceased in bed. After a complete autopsy complex congenital cardiac abnormality was identified. The principal anomaly was found to be the interrupted aortic arch, where the distal end was supplied through the patent ductus arteriosus from the pulmonary artery, along with right ventricular hypertrophy. There was evidence of moderate stenosis of the duct. Other findings were a patent foramen ovale, a perimembranous Ventricular Septal Defect (VSD), anomalous location of the pulmonary arteries and a congenital bicuspid valve. Conclusion: This case illustrates the necessity of a proper pre-natal screening to prevent infant deaths and the necessity of complete autopsy to post-mortem diagnosis perinatal deaths. Background: Sudden death in infants has a wide differential, but most often has no clear etiology. Most of the time after a complete autopsy cause of death remains unascertained in most infant deaths. Case presentation: This is a case about an 8 day old infant who was found deceased in bed. After a complete autopsy complex congenital cardiac abnormality was identified. The principal anomaly was found to be the interrupted aortic arch, where the distal end was supplied through the patent ductus arteriosus from the pulmonary artery, along with right ventricular hypertrophy. There was evidence of moderate stenosis of the duct. Other findings were a patent foramen ovale, a perimembranous Ventricular Septal Defect (VSD), anomalous location of the pulmonary arteries and a congenital bicuspid valve. Conclusion: This case illustrates the necessity of a proper pre-natal screening to prevent infant deaths and the necessity of complete autopsy to post-mortem diagnosis perinatal deaths. Sudden death of an infant, Complex congenital cardiac abnormality, Interrupted aortic arch, Peri-membranous VSD, Abnormal pulmonary artery, Autopsy, Pre-natal screening. There are multiple causes of sudden and unexpected death in the pediatric population. However, most commonly there is no clear etiology, despite a thorough investigation, including a full autopsy. These deaths are then classified as Sudden Infant Death Syndrome  (SIDS). The syndrome has an incidence of less than 1 in 1000 live births and not much is known about it, though maternal smoking, bed-sharing and low birth weight have all been found to be risk factors . Despite its prevalence, it is important to remember that SIDS is by definition a diagnosis of exclusion . The Ontario death investigation system continues to use the term Sudden Infant Death Syndrome (SIDS) as a classification of a unique category of natural infant deaths, where in the future, a specific underlying natural cause may be found, e.g. cardiac, neurologic and metabolic. These are cases that would benefit from further research within the scientific community that may find common underlying factors causing these deaths. The value of categorizing deaths as SIDS (i.e. recognizing SIDS as an “entity”) has been clearly demonstrated through focused research projects. After SIDS, the most common causes of sudden death are infectious and cardiovascular, each with a similar incidence . In the cardiac category, myocarditis and congenital defects top the list, compared to atherosclerotic heart disease in adults. Many cardiac defects have associated morbidities, but the ones most likely to cause sudden death include Tetralogy of Fallot and transposition of the great vessels . In this case report, we describe a case of a sudden unexpected death in a child of 8 days, which on autopsy was found to have a complex congenital abnormality as the most likely cause. The decedent was an 8-day old infant of South Asian descent who was brought in from the hospital. He was found unresponsive on the bed, after being put to sleep after a breast feeding session. This was the mother’s 3rd pregnancy to term, and her 2nd child. The delivery was a C section for breech presentation with no other complications. The infant was discharged home with the mother after two days. Investigation showed no history of child abuse, child services involvement or any psychiatric conditions. Only finding of note a history of co sleeping. On autopsy, the child was at the 91st percentile for length for age, and 84th percentile for weight for age. Rigor mortis was present, with lividity on both front and back and prominent lividity of the face. On external exam, there were signs of resuscitation, including an endotracheal tube, EKG tabs, and defibrillator pads. On internal exam, the heart weighed 32.6 g and appeared markedly enlarged and abnormal. The normal reference  for this age infant is 19 g. An image of the heart after initial autopsy is shown in Figure 1 show opened left ventricle with perimembranous VSD and bicuspid aortic valve. The lungs appeared normally lobulated, but with moderate to marked pulmonary edema. The liver was congested. 10 cc of pericardial fluid, 5 cc of pleural transudate and 80 cc of peritoneal fluid were present. The digestive tract and genitourinary system were unremarkable, and there were no other significant findings. On histology, the lung appeared highly congested and edematous, but there was no other diagnostic pathology. Further testing showed a negative toxicology report, and a negative screen for metabolic issues with no evidence of viral or pre mortem infection. Imaging showed no bony abnormalities or evidence of remote or recent skeletal injury. Detailed investigation and autopsy of the heart found complex congenital cardiovascular disease. The principal anomaly was found to be the interrupted aortic arch, where the distal end was supplied through the patent ductus arteriosus from the pulmonary artery, along with right ventricular hypertrophy. There was evidence of moderate stenosis of the duct. Other findings were a patent foramen ovale, a peri-membranous Ventricular Septal Defect (VSD), anomalous location of the pulmonary arteries and a congenital bicuspid valve. Figure 1. Interrupted aortic arch with interruption between the brachiocephalic and left common carotid (Type C). The arrow is pointing the aortic arch. This was a case of sudden death of infant less than one year of age, which was found to be due to a complex congenital cardiac deformity. Cases of sudden death in this age group often have no findings on autopsy or histology, despite thorough investigations, and are often classified as sudden infant death syndrome (SIDS). This can be very frustrating for the family as well as others involved. However, this case illustrates the necessity of always conducting a full investigation before a classification of SIDS. Though there were multiple findings on the detailed heart autopsy, the most significant in terms of clinic pathological correlation, was the interrupted aortic arch. As the interruption was between the brachiocephalic and left common carotid, it would be classified as Type C (Figure 2) according to the Celoria and Patton classification . The segment of the arch distal to the interruption is fed by the ductus arteriosus through the pulmonary trunk. Hence it is the right ventricle, pumping mixed blood courtesy of the VSD, supplying the majority of the systemic circulation. This abnormal vasculature is pictured in Figure 3, using STIR MRI. This strain on the heart would explain the marked cardiomegaly and right ventricular hypertrophy. This presentation was similar to other duct dependent lesions, where there is acute collapse as the ductus closes . Normally this closure occurs progressively over 2-3 weeks, with smooth muscle being replaced by fibrous tissue . The process is dependent on the natural post natal decrease in the level of prostaglandins, namely PGE2 and PGI2 . When necessary, the patency of the duct can therefore be maintained through exogenous PGE2, until surgical correction, with a patching of the VSD and reconstruction of the aortic arch . Figure 2. Heart after opening showing the left ventricle. The larger short arrow is pointing the peri-membranous VSD and the thin long arrow is pointing the bicuspid aortic valve and the origin of the aorta. Figure 3. STIR sequence MRI scan image showing abnormal vasculature and marked cardiomegaly and right ventricular hypertrophy. The thin arrow is pointing the enlarged and hypertrophied right ventricle and the thick arrow is pointing the interrupted aortic arch. The extent of the remodeling of the heart indicates that the "abnormal hemodynamic parameters" would have existed perinatally and in utero, and could have been detected. Current obstetric guidelines on prenatal screening, as of 2014, recommend checking the outflow tract in addition to the traditional four chamber view, to detect anomalies of the conotruncal region and the great vessels  since this increases the sensitivity substantially, from 52% to 65-90% the variability being due to factors such as operator skill . Initial screening can be followed by detailed fetal echocardiography and preparation for medical and surgical intervention. 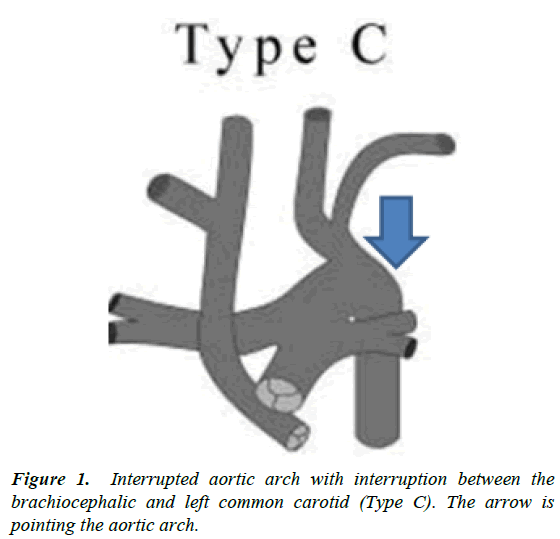 Repair of an interrupted aortic arch requires “individualized management”, but a recent study of Type A and B arches showed 79% 10-year survival . Together these studies show that proper prenatal screening and subsequent surgical management may have been able to save this child’s life, and at the very least, allowed for proper counseling and support [10-12] of the family. This case highlights the importance pre-natal screening in preventing sudden deaths in the pediatric population, as well as the importance of always performing a full autopsy. It is difficult to diagnose heart failure in infants, as they do not show all the signs and symptoms of heart failure compared to adults mainly the conditions of perinatal populations are often complex and there is no enough time to develop all the signs. It is important for a forensic pathologist to be aware of these complex conditions, and we recommend the involvement of a pediatric and a cardiac pathologist in these cases. We the authors declare that 100% of this work is done by authors. 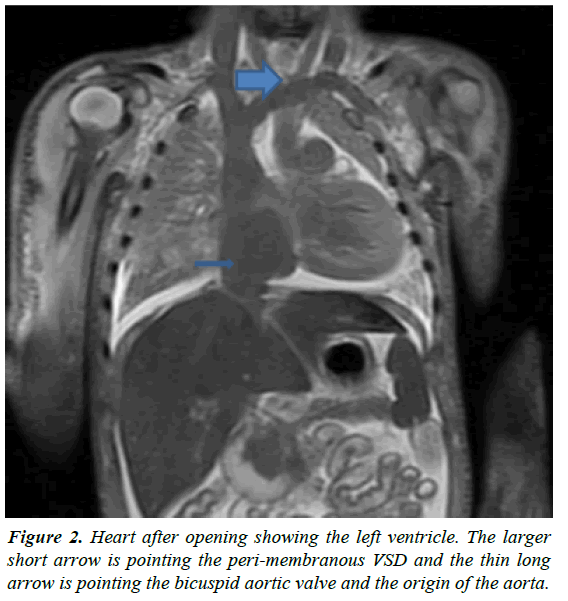 The autopsy was done by corresponding author and his contribution is 75%. The first author made the initial draft of the manuscript and the final version was edited and re-written by both authors. The contribution of the first author is 25%. We would like to thank Dr. Kristopher Cunningham, Cardiovascular Pathologist for his contribution to this case as a consultant. Willinger M, James LS, Catz C. Defining the sudden infant death syndrome (SIDS): Deliberations of an expert panel convened by the National Institute of Child Health and Human Development. Pediatric pathology. 1991;2:677-684. Byard RW. Sudden death in infancy, childhood and adolescence. 3rd edn. Cambridge University Press, UK. 2010:180-225. Coppelletta JM, Wolbach SB. Body length and organ weights of infants and children. Am J Pathol 1933;9:55. Celoria GC, Patton RB. Congenital absence of the aortic arch. American Heart Journal. 1959 Sep 30;58:407-413. Weinburg PM. Aortic arch anomalies. In: Allen HD, Driscoll DJ, Shaddy RE, Feltes TF, editors. Moss & Adams' heart disease in infants, children, and adolescents including the fetus and young adult. Lippincott Williams & Wilkins, Philadelphia, Pennsylvania, USA. 2013. Fay FS, Cooke PH. Guinea pig ductus arteriosus. II. Irreversible closure after birth. Am J Physiol-Legacy Content. 1972;222:841-849. Clyman RI. Ductus arteriosus: Current theories of prenatal and postnatal regulation. In: Seminars in perinatology 1987;11: 64-71. Carvalho JS, Allan LD, Chaoui R, et al. ISUOG Practice Guidelines (updated): sonographic screening examination of the fetal heart. Ultrasound in Obstetrics & Gynecology. 2013;41:348-359. Li Y, Hua Y, Fang J, et al. Performance of different scan protocols of fetal echocardiography in the diagnosis of fetal congenital heart disease: a systematic review and meta-analysis. PLoS One. 2013;8:654-684. Kleinman C, Glickstein J, Shaw RF, et al. Echocardiography and fetal cardiology. In: Allen HD, Driscoll DJ, Shaddy RE, Feltes TF, editors. Moss & Adams' heart disease in infants, children, and adolescents including the fetus and young adult. Lippincott Williams & Wilkins, Philadelphia, Pennsylvania, USA, 2013. Office of the Chief Coroner for Ontario, Canada. Paediatric Death Review Committee and Deaths under Five Committee Annual Report. 2016.